I'm certainly a lover of shopping small, and if you follow our Instagram feed you'll know that I'm always buying special pieces for the boys. I love the personalised touch, and it's so special knowing that my pieces have been hand crafted by someone with a genuine passion for what they do💕. Now and then it's important that us mums get to treat ourselves too. Kaya Jewellery specialise in creating pieces for babies, children and mums. The company was set up in 2012 by Tanja, mother of two daughters, who wanted to create pieces for mothers and their children. I was thrilled when they got in touch and asked me to review one of her pieces. The website is full of such beautiful items, and after many hours pondering I eventually selected a necklace. It's a silver disk, with a punched out heart. I also requested for the boys names to be engraved. 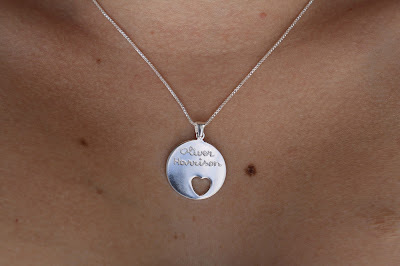 When I say I like the personal touch, all of Tanja's products are engraved by hand! The delivery was really fast, and I'm absolutely delighted with the necklace. I had a small problem so I contacted them, and the customer service was impeccable, and was resolved right away. The delivery presentation is wonderful. Those sort of things mean a lot to me! They also offer a free gift wrapping service, so ideal if you're a shocking wrapper like me! When it comes to jewellery I like pieces that I can wear everyday, rather than sticking in a drawer and then trying to hunt it out for a special occasion. This item completely fulfils that for me. The necklace is made of sturdy silver which means that it should be very hard wearing. Do you have someone in mind that would like a meaningful piece of jewellery? Or even fancy treating yourself? Head over to http://kayajewellery.co.uk. I also love the fact that she is committed to giving back, so she donates a percentage of her profits to a charity that supports children not as privileged as ours in Gambia. Be sure to also follow them on social media👇!